By now you are surely signed up with Google Plus. You know it’s an important platform to help grow your real estate business, but it doesn’t seem to be helping you as much as you had hoped. In fact, you may even blame its lack of success on the limited traffic the site seems to be bringing you. Well, I have news for you: There are millions of Google Plus users logging on every day. So if you aren’t getting their attention, it’s all on you. But don’t worry – you are about to learn how to turn things around. If you are serious about growing your Google Plus following — and actually gaining some clients from the platform — you should be doing these seven things. In order to win at any social media site and especially Google Plus, you need to get social! Hopefully you are creating amazing blog posts for your website: posts that are educational, helpful and fun to read. Now you need to be sharing these masterpieces on Google Plus. It will make you look like an incredible resource for information, but more importantly, it will get people to your site. You should be posting blog posts at least once per week, and you should share every single one with your Google Plus followers. Formatting your posts is important to give you that little extra edge. Google Plus allows you to bold words by putting a star before and after the phrase. For example if I wanted to bold the title to my post *Google Plus For Real Estate* this is how it would look. You can do the same thing to italicize something, as well. In order to use italics you put an underscore before the words you would like to highlight. It would look like this: _How to use italics_. These are just a few quick tips on how to stand out amongst the sea of posts. An example of this formatting display can be seen to the right. 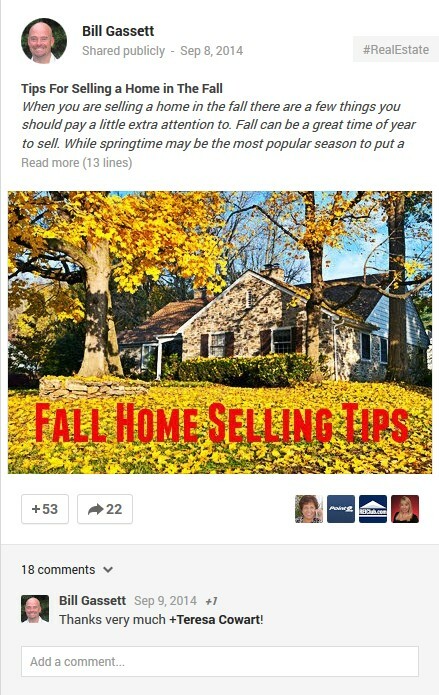 This article on tips for selling a home in the fall got quite a bit of interaction, as you can see. Notice the title is in bold and the first few sentences are in italics for emphasis. This is the first thing a search engine sees, by the way, so you want to make it good. One last item of importance to mention is the use of hashtags. In the upper right corner you will see the hashtag #realestate being used. This allows your post to be found more easily in a group of posts related to real estate. 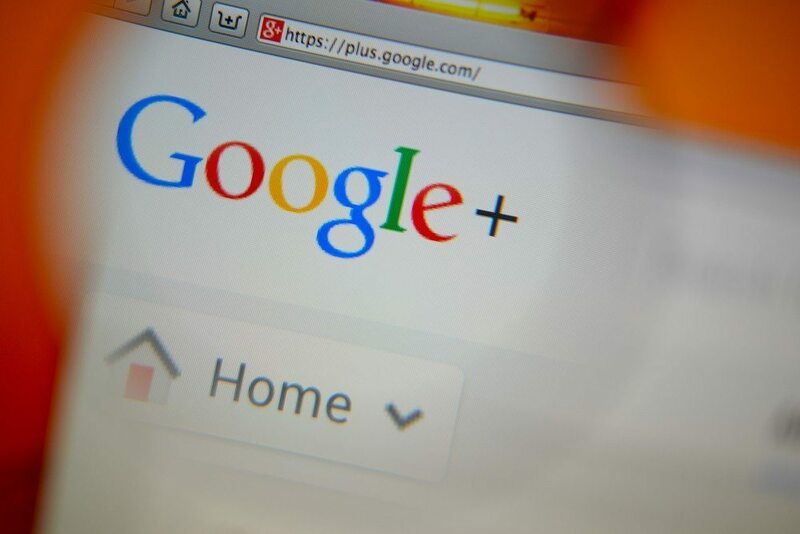 Google Plus is no different than all of the other social media sites out there. In order to make the most of it, you need to be interacting with your followers. If you don’t invest the time in building two-way relationships with others, then you may as well not even be on the platform at all. Engagement, sharing and reciprocation are three words that should be on top of your mind if you want to be a Realtor who wins at Google Plus. When you receive a comment on your posts, genuinely reply. If you have nothing sincere to say, a simply thank you will suffice. For bonus points, visit that person’s profile and reciprocate the love by commenting on some of their posts. Additionally, you want to be active on other people’s posts. When you look at your home screen, find articles that can provide value to your fan base and share them. When you do, “plus mention” them so they realize you have done so. The more chances you have to comment, share and “plus one,” the more people will notice you and follow you. When you join Google Plus your focus should be on others and not yourself. This is how you get noticed more quickly. Admit it — when you share a post anywhere, getting the satisfaction of someone commenting on it or sharing it feels great. This is what everyone strives for. Well, guess what? If you are consistent with this strategy, it’s easy to grow a fan base because people will love you. Sharing your listings and doing nothing else is a sure shot way of being a social media loser. Check out any Realtor who does this on any social media platform and you are bound to hear the sound of crickets because nobody cares about your listing on Main Street other than you! While it may be tempting to use Google Plus as an easy way to get your listings out there, this is a critical mistake. People know how to find listings, and if they wanted to see yours, they would go to your website. Everything you share should offer something of value to your followers. Perhaps it gives them actionable advice, or it makes them laugh, or it teaches them something. A listing does nothing for them, so it should be avoided. Your best bet is to share an intriguing blog post to get them to your website. If they are in the market for a home, they will surely locate your listings from there. Starting from square one on Google Plus can seem daunting. The best way to gain traction is to garner the attention of the Google Plus pros. It may sound challenging, but it’s really not. First, add them to your circles. You can add anyone you want to your own circles. While this doesn’t automatically get them to follow you back, they will get a notification, and will often reciprocate. More importantly, you should be sharing the content of these Google Plus influencers. When you share something of theirs, give it rave reviews, and plus mention them in the post, they will surely notice. Once they have followed you back, they will see your updates. All it takes is one post that catches their eye enough to share it (with their thousands of followers), and you just gained an abundance of new fans yourself. Of course, it makes sense that as a real estate agent you should share articles about selling a house or offering great first-time homebuyer tips. However, there are a lot of other topics that will intrigue your colleagues. Anything you can provide that will help them grow their own real estate business will gain you attention and followers. For example, almost all real estate agents have a website, but do they know how to optimize their content for the search engines? If you do, spill your secrets. Real estate agents love seeing great articles about search engine optimization (SEO) because it can help them with their business. The same goes for buyers. Yes, you want to share content that will help them through the process, but you also want to step out of that real estate box. Give them home decorating tips, do-it-yourself projects, and even ways to save money on electricity. Again, your goal is to be the go-to resource for all things home-related. You need to establish yourself as an expert, and you can’t do that by sticking to one genre of content. One lesser-known gem on Google Plus is the community feature. It can be found right in the drop-down menu, but it often goes overlooked. These communities are a goldmine for connecting with real estate professionals who can help you expand your Google Plus reach. You want to interact in these communities just like you do on your profile: share valuable content, have conversations and comment on the posts of others. However, there is one caveat: Many communities have strict rules on what is and isn’t allowed (such as no solicitation). You better be sure to read and follow these rules, or you risk being called out in the group, or even kicked out. Since real estate is a highly personal industry, your profile is a top priority. It lets your peers and potential clients know that you are a real person who wants to build a genuine relationship with them. That being said, you also need to create a business page. You can share all of the same content, but it makes you look more legit and further expands your reach. However, if you have a physical location where you meet clients, a business page is not optional. Why does it matter so much? Because of a little thing called Google My Business. Essentially, Google My Business takes the information from your Google Plus business page and puts it into their maps and search results. 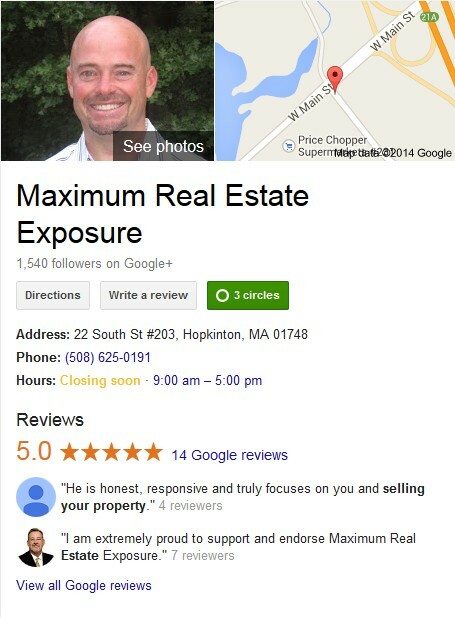 So when someone looks up “Maximum Real Estate Exposure,” for example, you will see I show up. But it won’t just be a generic listing; searchers will see your address, hours of operation, phone number, and a map telling them how to find you. In today’s mobile world, where everything is done on the go, these clickable phone numbers and instant directions are the key to helping people find you. Once you put these seven steps into play, you will be amazed at how much potential there is on Google Plus. Not only that, but it’s a fun platform to be on. Yes, it does take some time and effort, but it is definitely not for nothing. You will build connections and relationships, which, as we all know, are the key to a successful real estate career. A secondary benefit but one that should not be overlooked is the tie-in to search results. When someone does a logged in search at Google they are more likely to see search results of those who they are connected to on Google Plus. So if you have written an article and someone on Google Plus has interacted with you, the odds go up dramatically that they will see your content in their search results. Folks, this is huge because the more people who connect with you, the greater reach your business will have. While Google recently did away with Google Authorship, there are many in the SEO community who believe Google is more likely to be showing those who have built influence online in their search results. So if you are creating compelling content and there is social validation for it, Google at some point in the future could reward you for it. There is no doubt that Google Plus can grow your real estate business. You just have to set aside a little bit of time each day to invest in the platform. Like anything else in life, you need to set aside some time in order to be good at it. Use these seven Google Plus real estate tips and you will be well on your way to improving your social media skills. Remember, social media is about being social, building relationships and engagement. Do you have what it takes to be a Google Plus real estate superstar? This guest post was written by Bill Gassett, a Realtor with Re/Max Executive Realty who has been helping people move in and out of the MetroWest Massachusetts area for the past 27 years. Connect with him on Google Plus.